We have arrived! We are in downtown Cincinnati across from the Duke Energy Convention Center, the location of the 2012 NGS Conference. The convention center is a very nice, large facility. This is the 4th NGS Conference Miriam and I have attended. We attended Milwaukee 2003, Pittsburgh 2004 and Nashville 2005. We have also attended a few FGS Conferences in between. I got to see the Exhibit Hall this afternoon when I help set up the BCG booth, #431. There was a lot of activity in the Exhibit Hall and I can’t wait to look around tomorrow. 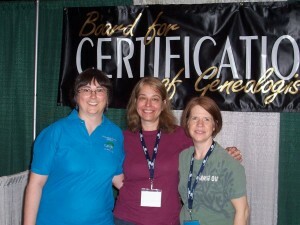 Also helping set up the BCG booth were Teresa McMillin, CG, Debbie Mieszala, CG, and Elissa Powell, CG. Elissa is the co-director of GRIP [www.gripitt.org] and she mentioned that their July courses are nearly sold out. Only a few openings are available. Elissa, Debbie & Teresa at BCG Booth. 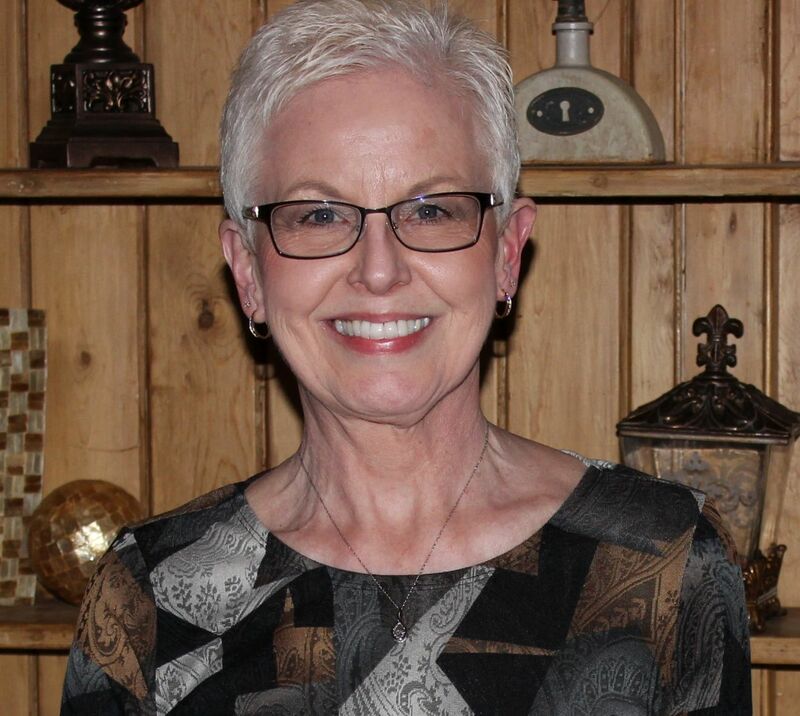 This evening I attended a media/blogger dinner hosted by FamilySearch. We had a nice buffet dinner that was a German/Cincinnati chili/Montgomery Ribs/Italian mix. Each of us received a “tech-trap” gift. It was fun talking with bloggers that I see frequently at conferences–Shelly, Amy, Ruth, Tina, and with bloggers that I met tonight–Karen, Julia, Pam and Lisa. Representatives from FamilySearch talked about their many on-line projects, but mainly they talked about the 1940 US Census indexing project. They reported that 30% 0f the indexing is complete in only 37 days. If this indexing trend continues the 1940 census index may be complete by July. I enjoy indexing the 1940 census and I encourage others to also give back by indexing. You can learn how to index and get started by visiting The 1940 Census Community Project [https://the1940census.com]. I believe I am prepared for the conference, which starts tomorrow. I have made copies of the speaker handouts from the syllabus, I have the Guidebook app on my cell phone, we have free WiFi in the hotels and in the conference center. It looks to be a great conference. I’ll be at the BCG booth from 9:15-10:45 tomorrow. 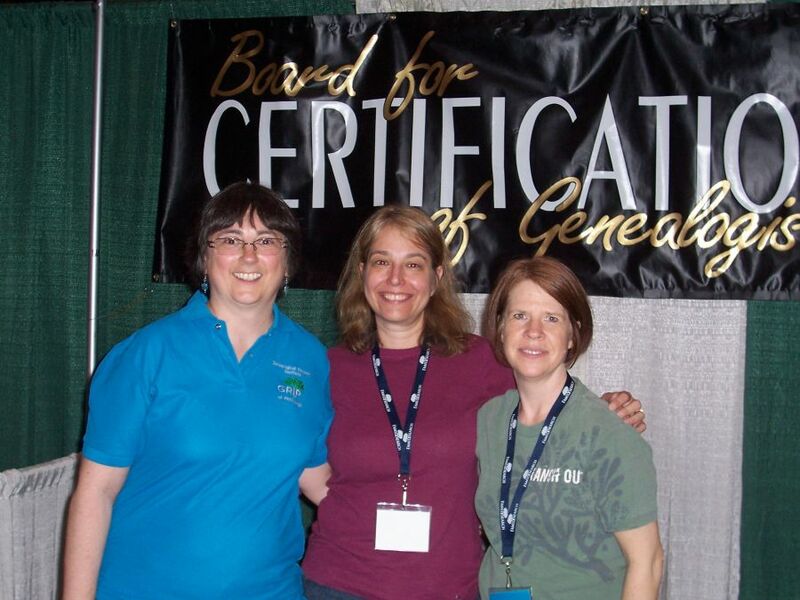 Stop by and say hello and learn about becoming a Board Certified Genealogist. After that I plan to attend the session “Researching Your War of 1812 Ancestor” by Craig Scott, CG. I hope to get some research tips to help with my US Daughters of 1812 lineage application for Nicholas Headington. I always learn something from Craig. After that that, who knows? I might skip an afternoon session to browse the exhibits and shop and learn.